Deciding to tear down the window wall in our soon-to-be bedroom was the easy part. 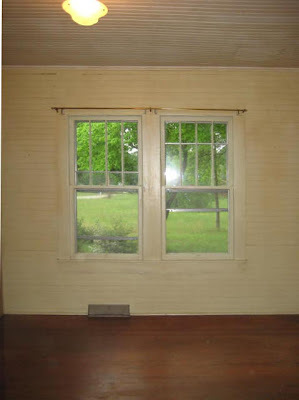 We knew we were going to replace the old drafty windows with energy efficient ones. We also knew we were going to put in better insulation and a vapor barrier. The hard part was trying to decide what to put back. and brittle. Most of them shattered during deconstruction. New energy efficient windows installed. New insulation and plastic vapor barrier. We couldn't reuse the old tongue and groove planks, and didn't want to try and replicate it. I felt a failed attempted match wouldn't look as good as a totally contrasting look. We discussed drywall, but even though he did it in the kitchen for me, Dan really dislikes doing drywall. The next idea was a Victorian style wood panel look. That's what we did. color of of wood that was beneath the painted tongue and groove. We bought and stained ready-made, off the rack trims from Lowes. Funny how the colors in the photos change depending on the time of day and light. Most of it will be hidden by draperies by the time it's done. Still to do is apply polyurethane. Then it's on to the ceiling. You and Dan have done a beautiful job in your bedroom. Having the energy efficient windows and new insulation installed will make a world of difference heating and cooling this room. I love the Victorian style wood panel look you made in the room. It gorgeous!!! That looks really nice. We're lucky, the previous owner of the farmhouse put in energy efficient windows (though I'm sure they could be better but at least they are newer, ha). I love the wood detailing, nice choice! Ooh! So cozy and nice! That is SO pretty! I never would have thought to go that route. Can't say I blame Dan...I hate all the steps there are to drywall lol. Just knowing that behind is nice fluffy new insulation and a vapor barrier would go a long way towards sleeping easy at night, not to mention new energy efficient windows. I'm curious as to why Dan doesn't like drywall? LOL, I am not showing this to Gene, but a brilliant solution to not having to do drywall. What a back saver too! Looks great and the windows are wonderful. I might have been tempted myself to stuff three in. I'm the "Oh heck, who needs a wall at all, let's make it all window" kind of gal, but it is a bedroom and you do live in a neighborhood. :) Can hardly wait to see it all done up. So pretty! I'm with Dan on disliking the process of putting up drywall and would opt for nearly any other finish if having to do the job myself. The bedroom wall looks great. I, too, love the trim you chose along with the "low" windows! Sandy, thank you! It makes a big difference already, for which we are relived, considering how hot or cold these rooms can get. The paneling idea came out well I think. 1st Man, good to hear from you! Lucky you indeed! Those windows are a must but expensive and a job to install. Stephanie, it comes from brainstorming and scouring the internet! Having a lot of old copies of This Old House magazines lying around helps too. Ed, indeed. Dan doesn't like doing drywall because he's never satisfied with his results. Of course, having true 2x4 studs and then building new window framing with modern "2x4s" doesn't help. Our walls all turn out lumpy, LOL. He's not a mud guy either. He'd much prefer to work with wood. Theresa, I am so with you on windows. What Dan really wanted was a bay window, even if he had to build it himself! We found such a good deal on these windows, however, that this is okay. I love all the light! Mama Pea, thanks! From reading the comments, it seems not too many of us like doing drywall! It's only benefit that I can see, is if one wants wallpaper. Wow! Love the beadwork on the trim! I love reading your home make-over and homesteading. Finally put a bid on an 1865 farmhouse with 9 acres with too big of a pond but still excited! Getting ideas to renovate the upstairs which had been overlooked by previous owners for many, many years. 1940s-ish wallpaper in one room! Those new windows really open up the room - I love the light! I am with Dan - I despise drywalling. I like the trim around the windows, too. You two have done a wonderful job renovating your house. Shannon H, thanks! It's not as ornate as real life examples, but I think it turned out well. I hope your bid is successful! The place sounds like a dream homestead. Susan, and I love all that light. Interesting so many of us don't like drywalling! That turned out very nice and such a pretty view ! What an interesting way to do the wall. I would never have thought of it, but that's pretty cool. I get more useful ideas from you two. Wow that came out looking very very nice! I really like the 9 over 9 lite windows! Just a heads up on the weatherproofing - I am not an expert, but have spent MANY MANY hours, literally, poring over what has actually become a very scientific field of home insulating and green building. From what I have come to understand the use of polyethylene sheet or plastic behind drywall or other material still is done some, mostly in places like kitchen & bath with high interior moisture content, but has steadily fallen out of favor, but it especially seems to be frowned upon when using faced batts in the walls (which I *think* is what I see. The faced batts, the kraft paper on them, themselves are vapor barriers and by putting sheet plastic on top of the insulation the situation exists for the *potential* of moisture entrapment and mold growth. Sandra, we thought that way at one time too. But the house is so drafty I doubt we'll ever get it truly air tight! Shawn, very good point. I had the same question, but Dan got some really good information from a gree builders website (which I cannot find now). The key is ventilation, yes even in the walls. As long as the air can move, it counteracts moisture content/ humidity. I know I'm not explaining that very well, but Dan isn't here to ask to explain it to me again. :o I'll try to get it when he's home, or at least find the podcasts from the website. Quinn, it really turned out well. I'm pleased, as you can imagine! What is he going to do when there isn't anymore walls to open up and poke at?